Reverse osmosis (RO) is a water purification technology that uses a semipermeable membrane to remove particles and ions from drinking water. This membrane technology is not considered a proper filtration method. In reverse osmosis, an applied pressure is used to overcome osmotic pressure, a colligative property that is driven by chemical potential, a thermodynamic parameter. Reverse osmosis technique is widely applied in both industrial and residential aspects to remove molecules, ions, bacterial, virus and other toxicant. Ordinary water filters use a screen to separate only particles of dirt sediments from water. Reverse osmosis employs a semipermeable membrane that removes not only particles but also an extremely high percentage of dissolved contaminants-molecule by molecule- from raw tap water. The membrane consists of several thin layers or sheets of film that are bonded together and rolled in a spiral configuration around a plastic tub (This is also known as a thin film composite or TFC membrane.) 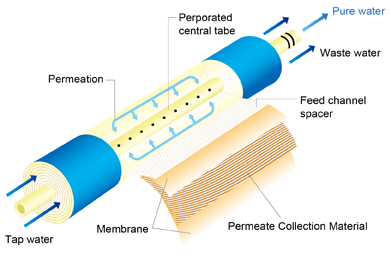 The material of the membrane is semi-permeable : it allows water molecules pass through while acting as a barrier to dissolved solids (for example, mineral, chemical contaminants, heavy metal ions) When the feed water stream passes across the surface of the membrane, the molecules penetrate the membrane surface, working their way around the spiral and collecting in the center tube. The remaining contaminants are “concentrated” and washed from the surface of the membrane down the drain (waste water). The pure water or known as “permeate” will be collected in the center tube and become the product water of RO systems.